Alice In Chains are a band with a well-told history. That I won't repeat it isn't to disrespect what is a fantastic opening salvo of records, or the wonderfully gifted Layne Staley, but they are more than a footnote in rock history. They very much continue to rumble in their inimitable, ominous way, and have done so for three records post-Staley. In William DuVall, they possess a vocalist who has helped remaining band members Jerry Cantrell, Sean Kinney and Mike Inez continue to demonstrate why it was that the record-buying public fell in love with the band as a whole as much as Staley's fearsome bellow. There are plenty of great examples of their songwriting across Rainier Fog, their latest offering. 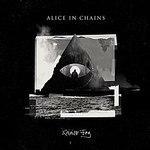 My first impression - and one that happily doesn't diminish during the run-time - is that the production is spot-on for an Alice In Chains record. Nick Raskulinecz has brought out every nightmarish string scrape and echo, as well as blown the rhythm section up into something approximating the red giant quoted in one of the album's tracks. It has a huge, dense bassy sound, and the band has never sounded better. Lead-off single The One You Know is the perfect opener. With a simple, yet sinister verse and particularly strong chorus, topped with the band's signature dual vocal harmonies and an instantly recognizable Cantrell solo, it's a rock-solid jumping-off point. The title track and Red Giant continue in this fashion, the track listing seemingly set up to reel off a one-two-three punch before settling into the acoustic-led Fly. These two tracks are interchangeable: the latter has a bludgeoning riff and a big sound, the former dynamics that recall Dam That River and a pleasing clean break, but it isn't until we hit track four and five that the record starts to ratchet up through the gears. Fly is a largely acoustic track, the type that Alice In Chains writes so well, with clean and overdrive guitar tones sat sweetly together as Inez's bass threads through the mix. It's a well-arranged piece with a strong chorus and some surprising musical passages - the transition on guitar directly after the chorus takes it into interesting territory melodically and offers just enough variety for it both to be catchy and to catch the ear. Drone is a lumbering beast of a track sat right in the middle of the record, and with good reason. The main guitar riff is the sort that Tony Iommi would nod sagely in approval at, and further confirms what I've always believed listening to the group, that they can't purely be categorized as part of "the grunge movement". The tones are too heavy for one; this winding, plodding guitar line draws us straight into Sean Kinney's swing groove - DuVall and Cantrell's twin vocals here are particularly effective, and when the song changes meter and introduces 12-string guitars it becomes a real treat, building into another perfectly wrought solo from Cantrell. As a long-time admirer of Cantrell's overall guitar playing I'm delighted to report that his leads are as consistent as ever; never dominating tracks but always offering the song a taste of something else musically. He achieves this on Maybe, the second acoustic-lead track on the record, aided by another particularly sweet mix. DuVall and Cantrell's guitar tones make for a very pleasing blend - this is as close to country as I've heard the group get tonally, and the southern sound is handled very tastefully, with another decent chorus and arrangement that takes familiar chord patterns into a region somewhere uniquely theirs. So Far Under and Never Fade, the other pre-release singles, follow: the former is a stonewall Alice In Chains classic in the making, and is a contender with Drone and the latter for best track of the album. A gargantuan sound built off the kind of devilish riff and tempo that the group has made a home is accompanied by wonderfully dark vocals, not afraid to drag us deeper into darkness - the chorus swells and manages to sound wonderfully apocalyptic, its descending chord pattern creating the aural sensation of being pulled into an abyss. Never Fade is as successful for very different reasons - it is just about the most uptempo number Chains have produced, and operates on a totally different platform structurally, boasting what is the catchiest chorus on the album with Kinney and Inez providing the sort of driving, solid rock rhythms you don't usually associate with the group. All I Am rounds the record off in more ponderous fashion, with plenty of lyrics wistful in tone ("Is this all I am? Given all I can? ), the track leading in and out with decaying effects as the snare thwacks with phase. So where does this album stands in the group's discography? That is a debate for another day. What can be said is there is plenty here to suggest that the current iteration of Alice In Chains have produced a great rock record on its own merit. It isn't an outright classic - my relative passing over the title track and Red Giant should tell you what I think of these in comparison to the other cuts. They aren't bad by any means but don't have the same power as others, and I feel they leave the track listing particularly hamstrung - I would swap Never Fade for one of them for some separation of tone and to keep the dynamic feel established early on by The One You Know. The only other blemish is Deaf Ears Blind Eyes, which doesn't do anything the other tracks don't do better, or with more variety. Rainier Fog has enough highs mind to comfortably recommend as a must-listen – a lot of this material is what Chains do best. Here's hoping several of these beauties stay in their setlists for years to come.